Besides writing a great story with a compelling blurb, I definitely wanted to know how Sever got the word out. Arcane is your debut novel, and it’s obviously appealing to a lot of people. What did you do before you started writing? Has your background influenced the way you’ve thought about writing or marketing? I used to make music. I wrote three albums over the course of about 16 years, the third of which was my opus, my masterpiece. If I were to die today, I’d die fulfilled, knowing I put out something I could not top. The grand search for quality in my music ended with that record. Took me nearly four years to finish it. It had been mastered by the top mastering engineer in my genre—same guy who did Nine Inch Nails, Marilyn Manson, Judas Priest, etc. I had half a million plays on myspace, and a song in a feature length film. Some shows, I had the audience in the palm of my hand. Then Myspace died a fiery death, I got tired of the ego trip of it all, and the music industry as a whole just … drained the life out of me. There was no joy in it anymore. And so I lumbered around for a while, trying to figure out what I wanted to do with my life. One day, after reading Harry Potter for like the fifth time, I recalled a dream of writing a book, and started clacking away at the keys. Within three months I finished a novel. When I first started writing Arcane, I didn’t even know if it was going to be sci-fi or fantasy—I just wrote by the seat of my pants, loving every moment of it. I settled on fantasy quickly though, mostly because that’s what I’ve loved since childhood. I wrote a story I wanted to read, with no expectations of career or anything. I just wrote for the sheer childish fun of it. And I haven’t stopped—I’ve finished three books in the series so far, with a fourth on the way. Everything since that music album has been a bonus. It’s funny, I never pictured being an actual author, let alone a “successful” one (at least for the moment). Life is strange. That's definitely an interesting background! After you turned your artistic focus from music to writing, at what point in the writing process did you begin to think about marketing? After about the 200th rejection. Turns out, I wasn’t a very good query letter writer. You see, sometime after like the 10th draft, I started searching for an agent. I wasted at least a year trying to go the traditional route. I had a plan inked on a giant piece of brown paper, with the traditional route first, indie route second. It detailed the life I wanted to live. When it became obvious Harper Collins wasn’t going to come calling, I just went full-bore Indie. I studied marketing from the pros, the people making a living from writing independently. I hung out at the kboards author forum, soaking in their knowledge like a sponge. I took notes and observed, or “lurked” before finally joining in the discussions by making an account. But I also hit the books in regards to writing. I considered myself a lousy writer, and learned from the best—Wuthering Heights, Anna Karenina, Harry Potter. Took extensive notes on what made books tick. Read at least ten books on just how to write, edit, the works. I was a med student. You should see my notes—a torrent of minutiae. After about two years of studying marketing, successful indie publishing, and writing, I published Arcane in late November. It made the Hot New Release list and went on to hit #1 in the USA and the UK in its fantasy subgenre, ranking as high as 2307 out of over 3.5 million books. It’s funny, it hit the Amazon charts the day before my book launch party. That was a fun night. But nothing lasts. These things come and go, I know that. I have to keep writing more books, and that will be my focus in 2015. How would you summarize your overall marketing strategy? Make the best possible platform I can in the time allotted—build my mailing list, a sturdy social media following, a clean website, write very high quality fun books, then release them. I have a mailing list signup at the end of Arcane. I know people are finishing the damn thing because I’m getting 3-5 new subscribers a day. That can only really be coming from the book. Talk us through your release day. Would you describe it as a soft release, or a hard release with lots of publicity? How much planning went into it? Definitely a soft release. I had no media, no social media presence other than the remnants of fans from my music. I had a mailing list of hundreds of people. Guess how many times I used it in the five years of its existence. Yup, not once did I mail the people that signed up to my mailing list. It’s embarrassing, I know. My first mailing to my fans was about my damn book. I shake my head at myself. 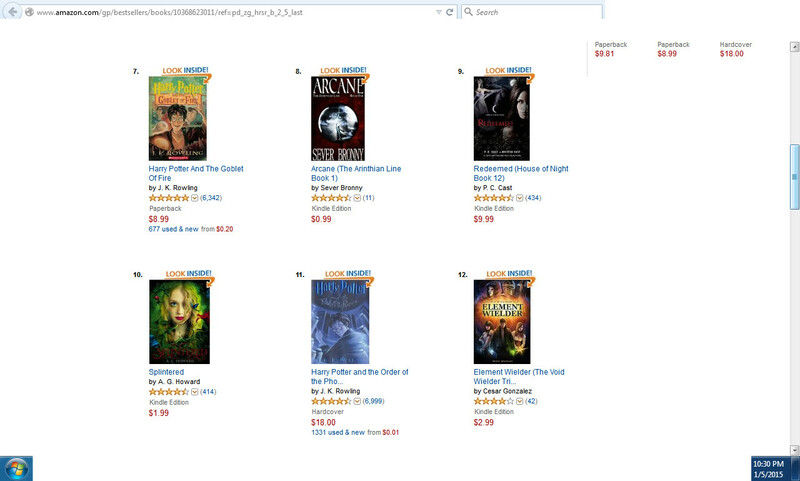 Every time I’ve looked, your book is ranking high: in the top ten for a few different popular categories. Has that been consistent since you released? Or have their been ups and downs? I’d say it’s been fairly consistent since hitting the Amazon charts two weeks after release, though has dropped a little since getting booted off the Hot New Release list, which was inevitable since you can only be on it for 30 days. I’m continually surprised and humbled by its success. I wasn’t planning on hitting the top 100 in my genre for another five years, let alone the top 10—and during the Christmas season no less, the most competitive time of year for books. I kept hearing how people don’t buy the first book in a series without having the rest available too. So I’m very lucky and very thankful. And as my author colleagues keep reminding me, readers are quick to forget you if you don’t pump out another book, so as much fun as this is, I have to get to work, and fast. Luckily, I’m indie published, which means readers don’t have to wait a year between each book. Book two in The Arinthian Line series, titled Riven, is scheduled to be released Feb 21st 2015. For some reason, keywords have flummoxed me more than anything else. I'm pretty sure I'm still messing them up. How did you figure out keywords and categories? These things are way more complicated than I’d anticipated. I researched fantasy keywords and brainstormed them, narrowing the pool down until I had the final set. I asked myself, if someone was searching specifically for Arcane, what would they type? But what was tougher, in fact the toughest thing of the entire publishing experience, was the damn blurb. Ugh, like pulling teeth, I tell you. I put it up for public critique and it just got shredded time and again. And everyone had a different opinion on where it should go. I must have written and rewritten it over a hundred times, no exaggeration. Awful, awful experience. Did you do any sales and promotional advertising or giveaways after the book was released? Any paid advertising? I did a book giveaway on Goodreads. Signed first edition copy, which ended up going to an Australian. I also messed around with Google Adwords with the help of a friend, and then Facebook advertising, but I’m not sure how effective they’ve been. I do recommend it to start though, to get that trickle of sales. If you can stay above zero sales for about two weeks, you stand a chance of getting on an Amazon bestseller list. In that entire two week period, I only had two days of zero sales. So I think that was a factor in exposing Arcane to more people. Overall, what was the most successful strategy you employed? My most successful strategy is quality control on all levels. A strong cover. A strong blurb. Strong keywords. Strong website. Strong writing. I studied each step as if my life depended on it. I took it very, very seriously. I think a lot of indie writers make the mistake of thinking only their writing has to be strong. Maybe if you’re traditionally published, but not independently. That’s the trade-off. Want to write indie? You better make sure your business hat gets lots of wear. And you better love business, because this is business. When you’re not writing, you’re a CEO of a corporation, and you have serious responsibilities to your consumers and your product. And I can’t emphasize quality control enough. On all levels. Quality is key. Quality opens doors. Quality is timeless. Are there any mistakes or things that you would have done differently? Besides starting sooner? I’d have studied book advertising more. I think I could have had a much stronger release. I’d have studied the details on the kindle countdown deal. I’d have booked Ads far more in advance. I’d have figured out a way to get more reviews. What do you have planned for the future for your series as well as for your marketing strategy? My marketing strategy will continue to evolve, based on current market conditions, other authors and what works for them, and my own insights. I’ll continue sharing what I learned on my blog (http://severbronny.com) and on the forum as well. Right now I’m going to try to stick to the three month KDP schedule of releases: release a book in KDP KU. Then, three months later, release the next book in the series while taking the first one out of KU and making it go wide. Three months later still, release the third book, taking the second one out of KU and making that one go wide. Rinse and repeat. I’ll be putting my books into Apple iBooks, Google play, B&N, and Kobo. Or I may hold them in KU for two stretches at a time (six months), we’ll see. The whole KU thing is a contentious issue right now, and subject to change. We as authors have to be flexible. But I believe, after seeing Myspace suddenly explode, that it’s always wise to place your eggs in multiple baskets. As for the writing, the plan is to end The Arinthian Line series at five books, but it depends on my main characters, Augum, Bridget and Leera—I’m just a passenger. They’re in charge, really. It’s an odd thing, writing. You’re at the mercy of so many variables, and that sometimes includes the personas in your books. I plan to release at least two more books in the series in 2015, maybe even three if I get efficient at the process. At one point, I cranked out 100,000 words in one month, so I know I’m capable of writing quickly. We’ll see how it goes. So far, so good though. Sever Bronny is a musician and author living in Victoria, British Columbia. He has released three albums with his industrial-rock music project Tribal Machine, including the full-length concept album The Orwellian Night. One of his songs can be heard in the feature-length film The Gene Generation. Sever's passion for fantasy began with role-playing games and the Dragonlance series, and continues today with his love of Harry Potter and Game of Thrones. Arcane is his first book.